•	In the attic, a metal tray is suspended with help of hanging steel rods. The steel rods are attached with collar ties of the attic. •	The dehumidifier is set on the can. •	Now in the ceiling of the hallway a square hole is cut to install a new return-air grille. •	A flexible return duct is now joined to the respective port of the dehumidifier. •	The duct is now secured to roof framing with plastic straps. •	It is now aligned and attached with grill installed in the hallway of the ceiling. •	A receptacle for supply duct is cut into air-conditioning duct system. A supply duct is connected at one end with dehumidifier and the other end at the receptacle in existing air conditioning duct system. 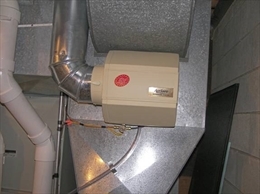 •	A condensate pipe is run from the dehumidifier to the outdoors. It is made of PVC. •	The dehumidifier's filter is installed. The humidistat is mounted on the wall and connected with dehumidifying with cables.